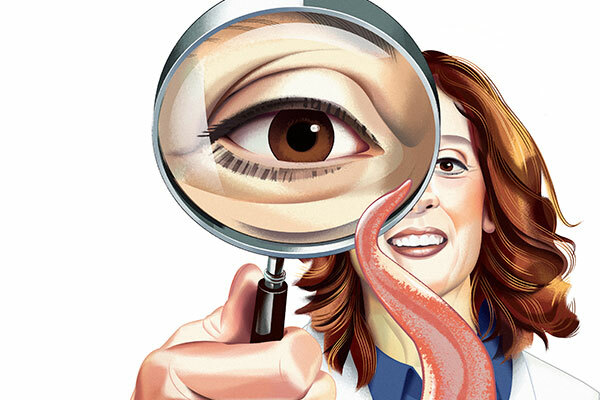 Dr. Elissa Hallem’s groundbreaking work to understand how tiny parasitic worms use odor detection to find and invade human hosts earned her the prestigious MacArthur “Genius” Fellowship in 2012. Her research has global implications; Strongyloides stercoralis, commonly known as the human threadworm, affects an estimated 30 million-to-100 million people worldwide and can cause chronic gastrointestinal distress and, in patients who are immunosuppressed, potential death. Research into how the worm behaves can lead to improved prevention and treatment strategies. Dr. Hallem steps into the U Magazine Spotlight. When did you first start thinking about science? I guess I have always been interested in science. That probably was because of my dad. He has a PhD in chemistry, but he is not a chemist. He became a computer programmer, but he always had a very broad interest in science. He would cut out articles from Scientific American for me to read, and he always was very encouraging in terms of my pursuing a career in science. The first research lab that I worked in was here, at UCLA, when I was in high school. I don’t really remember the first experiment, but we were looking at different mutant phenotypes in fruit flies, and we were sectioning the eyes and looking to see how they developed. That’s as close as a I can recall to a first experiment. Someone whose science I really admire is my post-doc advisor Paul Sternberg at Caltech. What is so great about the way Paul does science is that he is interested in everything. He has really broad interests and is willing to pursue any interesting question that the people in his lab want to pursue. He is equally excited about everything that’s going on. I really like my work. I also really like hanging out with my kids, so I guess I’ll say it’s when I’m spending time with my kids, reading with them. It’s a lot of fun when we’re immersed in a book series, like Harry Potter or The Books of Bayern. What has been your finest achievement? My lab has been working to develop tools to study the neurobiology of parasitic worms. Previously, not much was known about parasitic worms because there were so few tools to study them. Now that we have developed tools, I think we’ll be able to move the field forward in new ways. What is the characteristic that most defines you? Maybe it is that I am extremely, and perhaps overly, careful and take a cautious approach to science. What are the qualities of a great scientist? Being able to find a unique direction. I’ve never liked the idea of doing something where I know there are a lot of other labs doing the same thing, and then it’s just a race to see who does it first. I always have tried to find research areas where I think there’s a really important biological question or a question with public health relevance, but where nobody else is working or where progress isn’t really being made. I appreciate colleagues who really get excited about science in general and who think outside of their specific research areas. Some of the best interactions I’ve had are with people who are not necessarily in a related field but who really take a broad interest in science and are willing to engage with research outside of their areas. My mom. She is a lawyer and has always worked full time, but she always made time for us. For a long time, I didn’t quite realize how exceptional that was. She was one of the only working moms when I was growing up. Now she is a partner at her law firm, and she is involved in a number of programs designed to help the young women at her firm succeed and become partners. I think that’s really made a huge difference in the lives of the young women at her firm. If I think in terms of doing something I might enjoy, it probably would be something that involves writing. I enjoy writing grants and papers; it’s a lot of fun. To which super hero do you most relate? I’m not really up on my super heroes. I recently watched the second Incredibles movie with my kids and I did enjoy that movie. But that’s about all I can say in terms of superheroes. What are you most compulsive about? Arranging data into figures and making sure that all of the figures have the same line width and all of the fonts are the same and they’re all lined up perfectly. My lab likes to make fun of me about that. Working with the people in my lab. I really enjoy working with such a great and talented group of people and seeing them develop scientifically and find their own research interests. I like both the beginning of the day and the end of the day. At the beginning of the day, I drop off my kids at school, and I come in to work and I have the whole day ahead of me to get things done. And at the end of the day, I pick up my kids from school, and I know I will have time to spend with them. What has been your biggest aha! moment? For my post-doc, I studied insect-parasitic worms. We were using the insect-parasitic worms as models for human-parasitic worms. At some point, it became really clear to me that if I wanted to understand human-parasitic worms, I actually had to study a human-parasitic worm and not an insect parasite as a model.